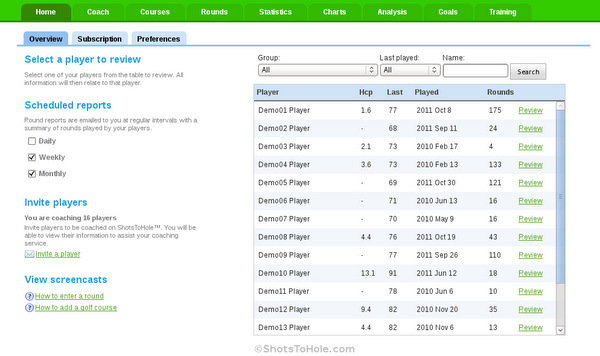 Receive reports showing your players' completed rounds allowing you to keep up to date with player progress. Compare one of your players to the average of the group. Rank the players within the group. Rank your players in many statistics, for any time period and round type. Record and categorise player and lesson notes. Help maintain professionalism and continuity between lessons. Benchmark players against themselves, another player, or ShotsToHole.com's extensive database of shots. Analyse your players' games with the innovative and patent pending What-if-Analysis™. Identify the areas that have the most effect on a player's score and design practice plans tailored for score improvement. Set goals based on findings from What-if-Analysis™, or set goals in any statistic. Help maintain player focus and assist in monitoring their progress. Make practice relevant by designing practice programs that focus on shots played on the course. We will refund your full subscription costs if the product does not meet your needs or expectations within 30 days of your initial purchase.